When we are children, we learn to crawl, learn to walk and learn to run. We fall down, our parents pick us up, and we are soon moving again. From our teens into our middle age, we run with agility, skate, dance, climb stairs and navigate the business office in high heels. When we fall, we blush but shake the embarrassment off and stand up again with only a few scratches. As we age, our agility and balance decreases, and we are more likely to take a tumble. And, when we do, we are more likely to hurt ourselves because our skin, joints and bones become more fragile. Falls are the number-one cause of injuries among the elderly, and the number-one cause of injury-related deaths for them as well. According to the Centers for Disease Control and Prevention, approximately one-fourth of Americans aged 65 or older fall every year (www.cdc.gov). The elderly may sustain several types of injuries from falling, including traumatic brain injuries; hip fractures; fractures in other locations such as the spine, forearm, leg, ankle, pelvis, upper arm and hand; and bruises that take a long time to heal. Many times these injuries send the elderly to the hospital or to a nursing home for wound healing, hip replacements and/or rehabilitation. 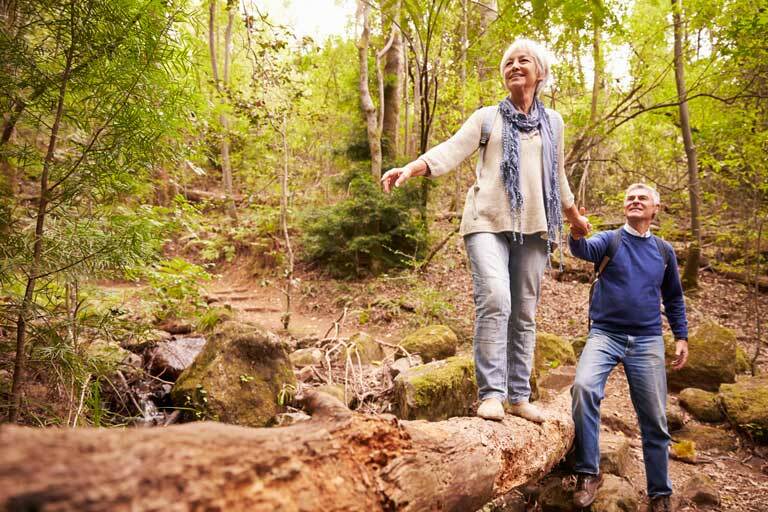 The long-term effects of these injuries can include limitations in lifestyle, limitation of movement, lack of exercise (and resulting effects such as lethargy and weight gain) and loss of balance skills, which could lead to subsequent falls. The risk of falling increases with age. It is also higher for women, although men are more likely to die from fall-related injuries. If you are unsure about your own or your loved one’s risk for falls, or want to learn better what to watch for, check your area for free risk assessments or screenings, which often are provided at community health fairs. You may also visit a skilled nursing and rehabilitation center or outpatient rehab clinic to speak with therapists about possible risk factors. Remove obstacles from the home, such as floor clutter and loose rugs. Purchase a shower chair, and sit while showering. Ascend or descend stairs slowly, and hold on to the hand rails. Exercise, taking it easy but keeping in motion. Simply walking is highly effective, and swimming can provide strengthening effects without the risk of falling and with a more comfortable environment for joints. Walk with a friend – having someone there can increase your confidence and make the experience more enjoyable. Have your vision checked regularly, and order new glasses if necessary. Many falls happen when individuals cannot see where they are going. Have your physician check your medications for any possible side effects that could cause dizziness, drowsiness or other causes of imbalance. Make sure your environment is well-lit, installing night-lights if necessary. If you have a history of falling, consider purchasing a hip protector to decrease the chance of a hip fracture. If you are at high risk of falling, you may benefit from physical or occupational therapy, both of which are covered by Medicare if the need exists. Physical therapists can help you build strength, increase balance and range of motion, and learn to use adaptive equipment that may allow you to live more independently while decreasing the risk of injury. Occupational therapists may help you learn to perform your daily activities with greater stability and confidence. Following these tips can help you avoid painful and costly falls. That may enable you to stay active and enjoy a long and injury-free life. After all, balance is a beautiful thing.